Good gravy, how is it February?! I still have a Christmas tree in my studio, but hopefully I can get it down this week :)! 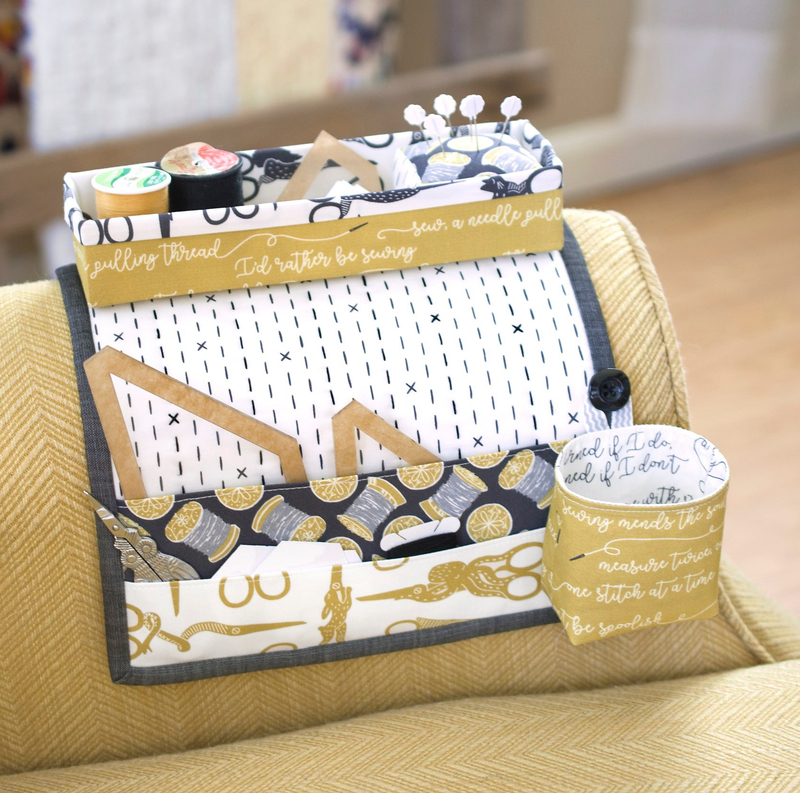 I’m SO SO excited to kick off the Mini Maker Station Sew Along (SAL) today! This pattern was in the works for SO long, because A) I’m slow, B) I’m busy, and C) it was a ton of computer work, which I loathe! However, it’s a pretty easy sew, even for beginners. If you haven’t downloaded the pattern, you can find it here. This SAL will run for a bit over two weeks, ending on February 18. In today’s post I’m going to talk just a bit about selecting fabrics and go over some of the other materials you need. I’m also going to share some tutorial links on basic quilting and binding for those who may be new to quilting, and a couple tips about thread catcher placement. This week we’ll be working on the main body of the Maker Station and the thread catcher. Next Monday I’ll have a new blog post with some tips about creating the fabric basket and working with the magnets. You are free to work at your own pace and in any order you’d like! Share your progress photos on social media with the hashtags #minimakerstationSAL and #minimakerstation to inspire and encourage others, and have a chance to win a couple fun prizes! If you haven’t picked up a hardware or are waiting for yours to arrive, don’t worry! You can still begin your project as there is plenty you can do without it, especially during the first week. You can create the entire body and just wait to sew the last bit of binding down until you have the metal, and you can create the thread catcher. There is also quite a bit you can do on the pin cushion and basket next week before you need to add the magnets. I want to quickly touch on why I don’t often include “fabric requirement” sections in my patterns, including this one. There are endless ways to layout and customize this project. I never want to lock someone into fabric placements by specifying what you should use where. One person may use three fabrics for the whole project, while another may use thirteen! Also, the cuts on a project like this are all small, so a fabric requirement list would simply be the same as the cutting instructions. The specific sizes of all the pieces you need for each part of the pattern are included at the beginning of each labeled section. Now, onto materials! If you have not already purchased a hardware kit or sourced your own materials, you can find more information about those materials needed here, including my sources. All fabrics used are standard quilting cotton. You could use some lightweight linens or blends, but thicker materials, such as canvas, may be too bulky for the pin cushion, basket and thread catcher, as they’re all pretty small. In addition to your fabrics, you also need a couple different interfacings. Sometimes these can be optional, as they are often used for added durability, but in this project they are required as they hold the magnets in place and create the basket. The first is Pellon brand SF101, also known as ShapeFlex. You can find this at any fabric store or Walmart with a craft section. You can also order it online. This can be substituted with another featherweight or lightweight fusible interfacing if you wish, but the SF101 is my preference. The second interfacing you need is Pellon brand Peltex 71F, ultra firm single sided fusible interfacing. I do not recommend substituting this with anything else as it creates the main structure of your fabric basket. Be sure that you get the 71F and not the 70 (sew in) or 72 (double sided fusible). This interfacing is very thick, it should look and feel similar to a piece of cardboard. It should not fold without “creasing” itself. You can also find this interfacing at fabric stores, Walmart (or the like), or online. Next week I’ll share some helpful tips for keeping the basket edges nice and crisp! For filling the pincushion, I like to use ground walnut shells because I love the weight and feel, especially with the square shape. It’s like an adorable little bean bag! I purchase mine at a local quit shop, but Plum Easy (the brand I get) also sells online here. If you’re making this for a gift, just avoid the shells if someone has a nut allergy! I have also used polyester stuffing in the cushion, which works perfectly fine! The last little “extras” you need are some thin ribbon or trim and buttons to hang your thread catcher (which is optional!). If you’re a sewist, but new to quilting, don’t fear! The body of the Maker Station is a great first project to dip your toes into the world of quilting! 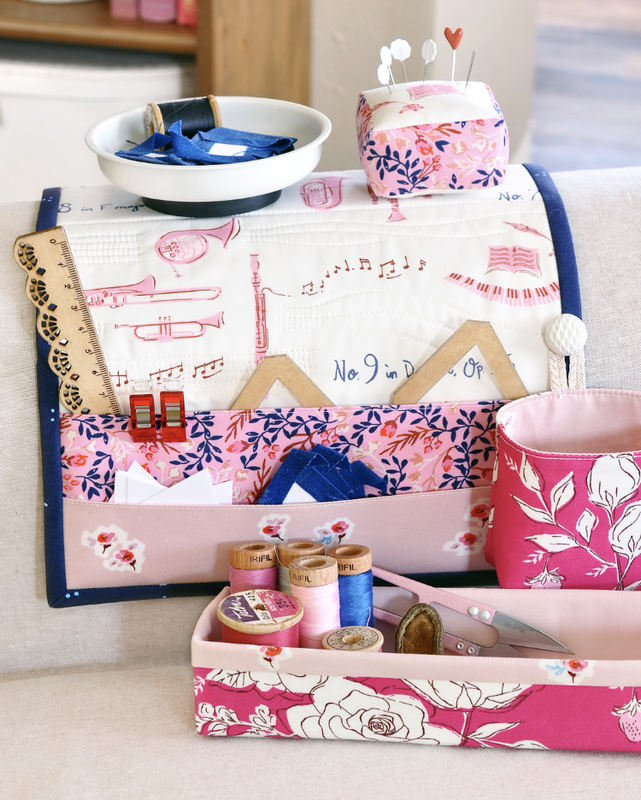 To create the main body of the Maker Station, you will need basic knowledge of how to layer your top, batting and backing and how to do the quilting stitches. 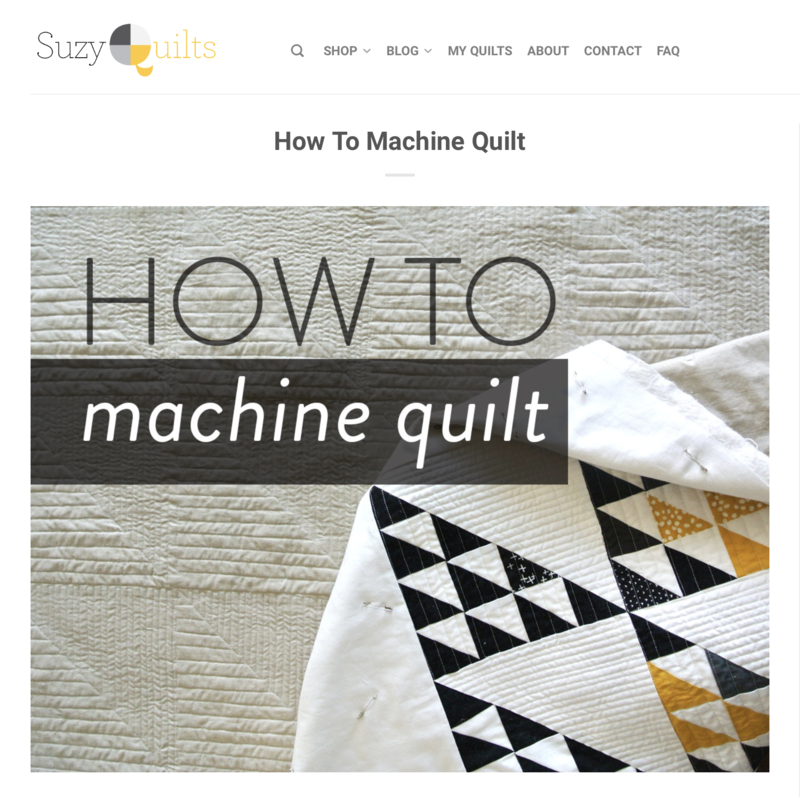 This tutorial from Suzy Quilts covers all the basics. It applies to a large quilt, so working with your main mat body will simply be a smaller and simpler version! Straight line quilting is a great design for beginners, or a crosshatch is a always a nice option, too. I’m not sure its mentioned in the tutorial, but I love using a Herra Marker (a bone folder or scoring tool also works similarly) to mark my quilting lines, especially for something like a crosshatch. Here is a video on using a Herra Marker. Another quilting technique you will need to know comes at the end of the body and thatt is binding. This is the little edge “wrap” that goes around the entire piece and seals everything up. Here is a helpful tutorial from Craftsy. The body and thread catcher are fairly straight forward and the pattern includes detailed instructions and diagrams on creating these pieces, but if you have questions at any point, feel free to email me through my website or contact me on social media. I’m always happy to help! 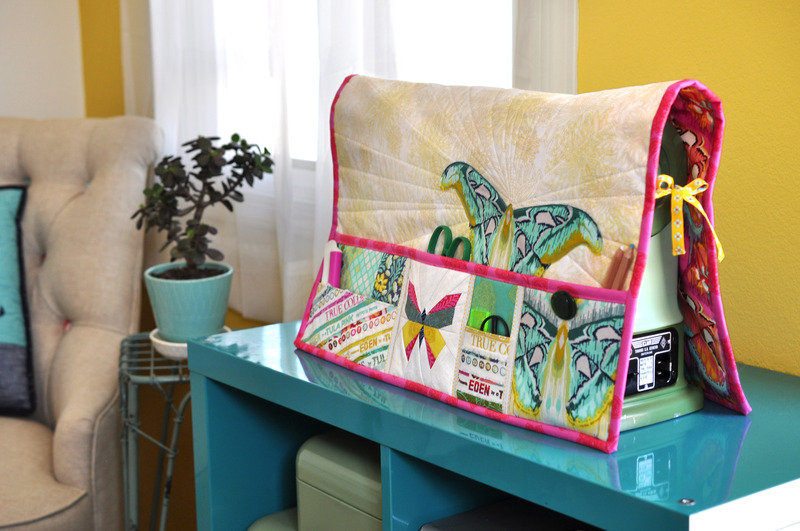 When it’s time to sew the buttons for hanging your thread catcher, think about where you will be using your Maker Station. I prefer to hang my thread catcher on the side farthest away from me so my leg doesn’t hit it and it’s not in the way of my pockets, so this placement will vary if you place the station to your right or your left. Also keep in mind it’s “reversible” in a sense, you can place either set of pockets on the inside of your seat or the outside. I sew at least two buttons on my body, but you can sew four buttons (one on every outer edge) so you’re fully versatile! As I mentioned, this little thread catcher is an optional piece, but I love it. If you don’t use it for scraps, you can use it for extra storage. 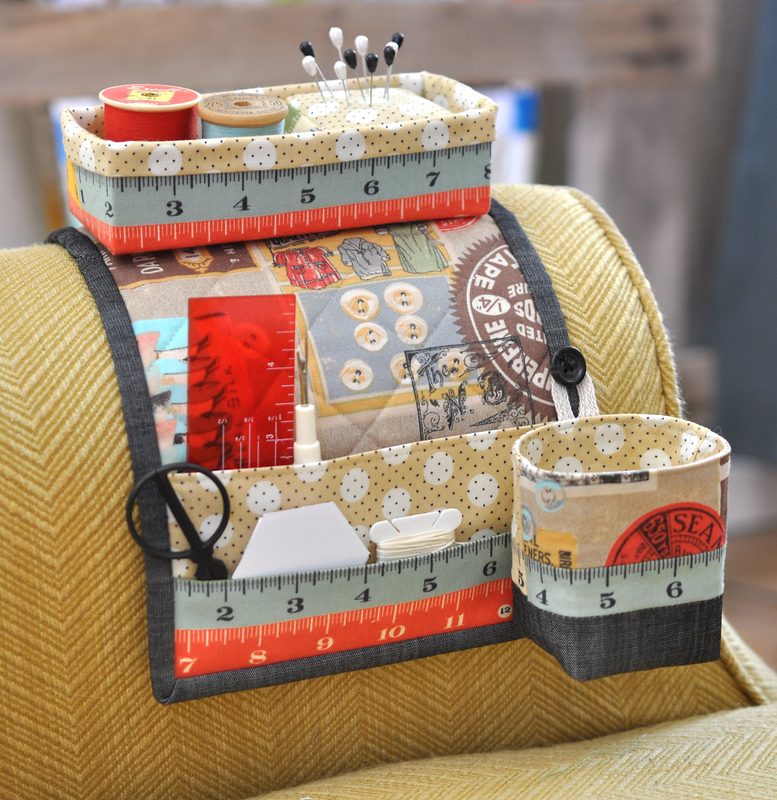 It’s also a handy design to use elsewhere, like on your sewing machine! So those are all the basics for this week as we create our main body and thread catcher. I will be posting photos of my progress on Instagram through the week, so I hope you follow along! I’ll also be sharing the prizes. Remember to use the tags #minimakerstationSAL and #minimakerstation, and share with a friend! December is here and I’m ready to start some holiday sewing! I’m super late, as always, but I’m only motivated when the holiday spirit is in the air. Today I’m sharing a little round up of my free holiday project tutorials and some ideas on how to use them! First up is a project I shared late last year, Santa’s Chimney Card Basket. I still cant get over how adorable this came out! This basket uses my Sturdy Basket Pattern with dimensions to fit all the Christmas cards you receive. I used brick fabric and faux fur to emulate the chimney, but you can use any fabric you love or that matches your decor. 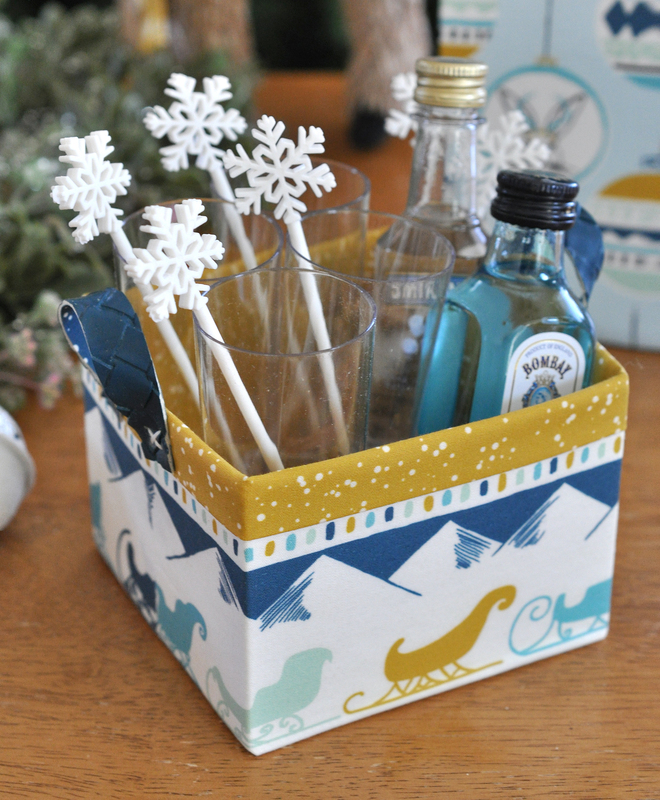 Aside from holding cards, It also makes a cute decoration or creative little gift giving vessel. You can even line it with a plastic bag and fill it with snacks for a party. Click here for the tutorial! 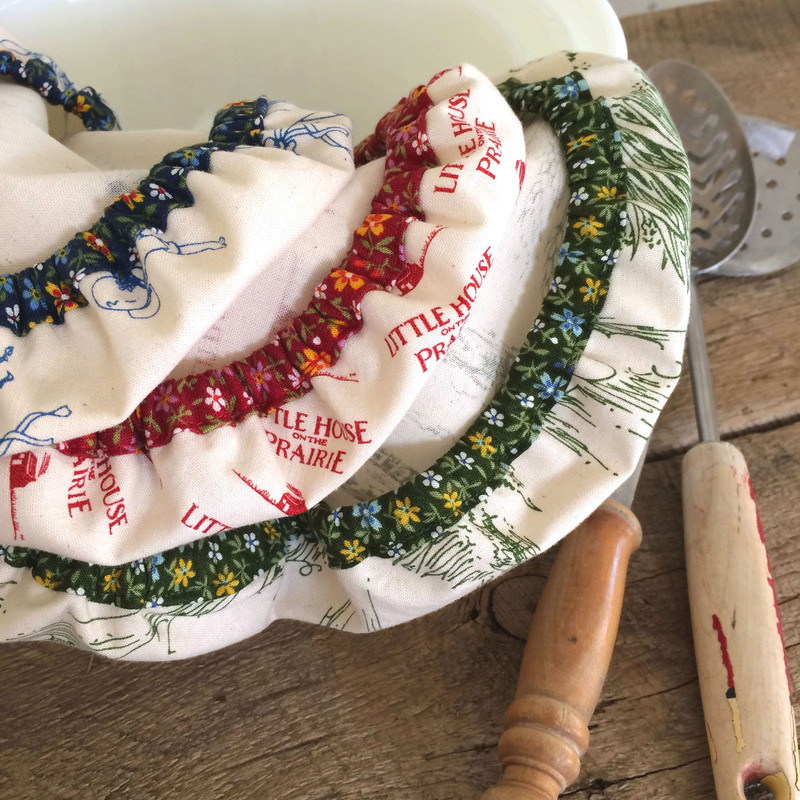 This next project uses the same Sturdy Fabric Basket pattern as the Chimney, shown in various sizes and shapes, that I made as gift baskets for the Hawthorne Supply Co. Oh What Fun blog hop. I absolutely LOVE making these, if you can’t tell! The possibilities are endless. 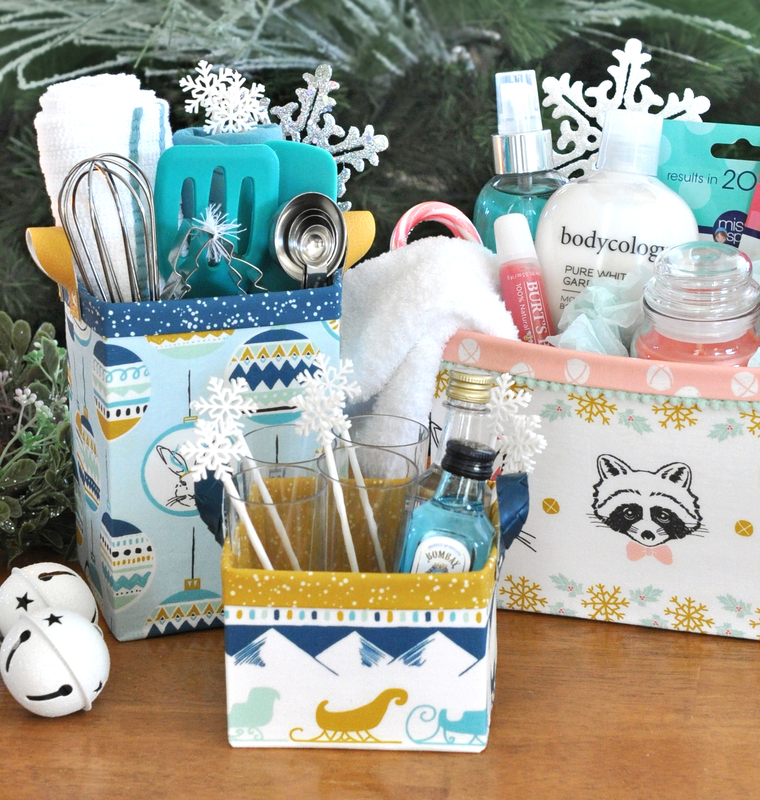 One of my favorite gifts to give is custom collections of themed items such as food, bath & body products, useful tools, etc. When you don’t know what to do for someone, you can’t go wrong with a gift like this! Once you have your items, you can make the basket any size you need to fit. You can also use non-holiday fabric, perhaps something that matches their decor, so they can also use the basket year round. They’re great for holiday office supplies, remote controls, phones and wallets by the door, hair accessories etc! Click here for my blog post about these baskets. It includes a link to the Sturdy Fabric basket pattern and details on how I made all the specific shapes and sizes shown. 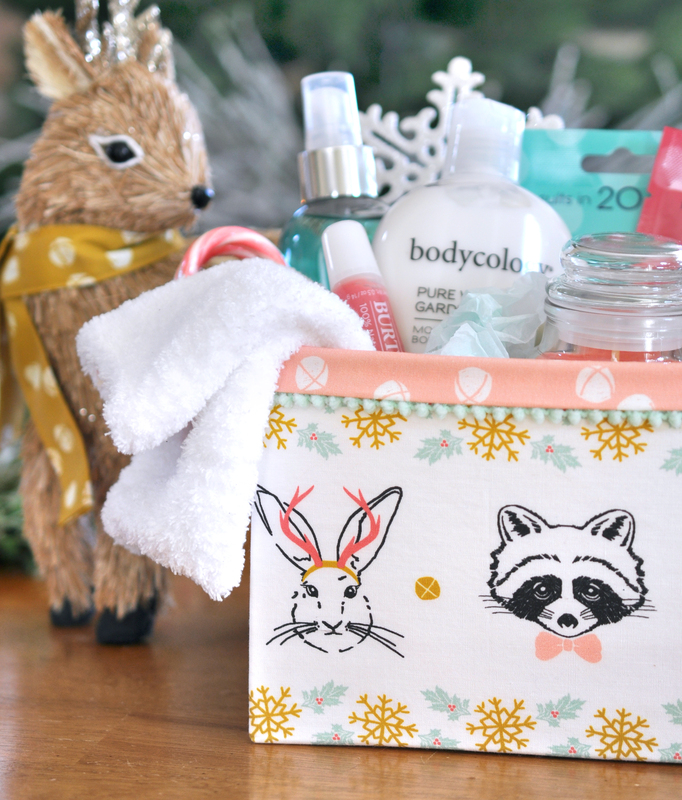 Also included in the blog post is details about the adorable snack bag shown below. It’s another fabulous little gift giving vessel that you can fill with treats for a neighbor, delivery driver, mail carrier! And the bag is then reusable (and washable!) for lunches, snacks, etc! Next is a little hand sewing project I shared a few years ago. 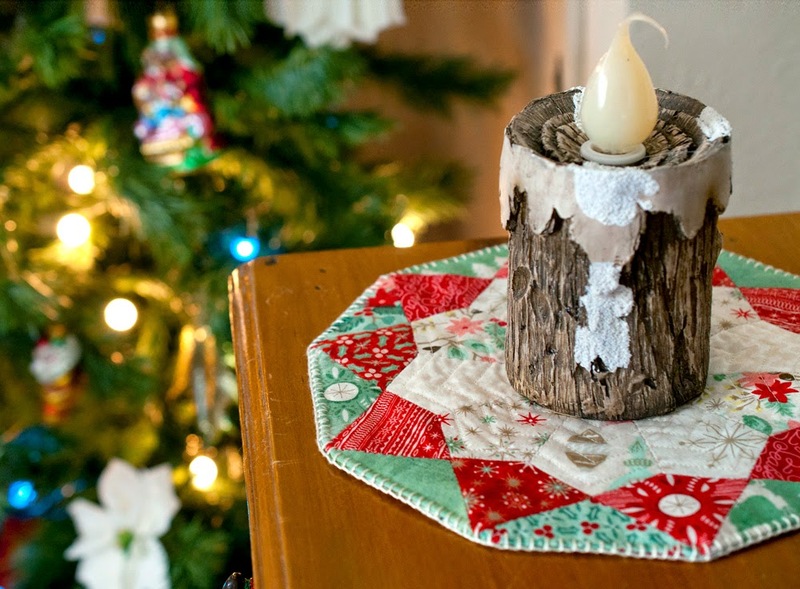 It’s quick and easy to sew and makes a perfect table topper, hotpad or mini tree skirt! Click here for the free pattern. Fourth is a mini quilt pattern I created using my Butterfly Charm Blocks in the shape of a Christmas tree. You can find the pattern here. The last project I’m including today doesn’t have a holiday look on the outside, but it’s a favorite of mine! 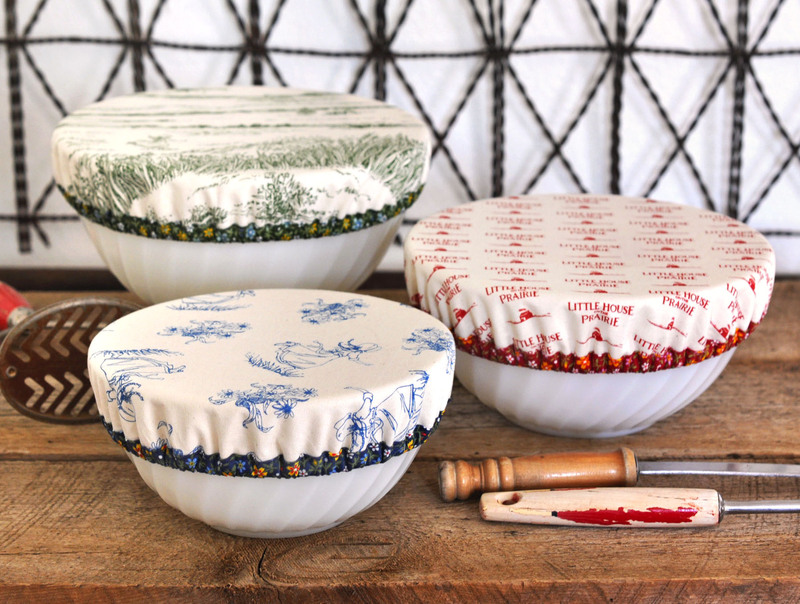 This pattern is super quick and easy to sew, and customizable to any bowl or round dish. 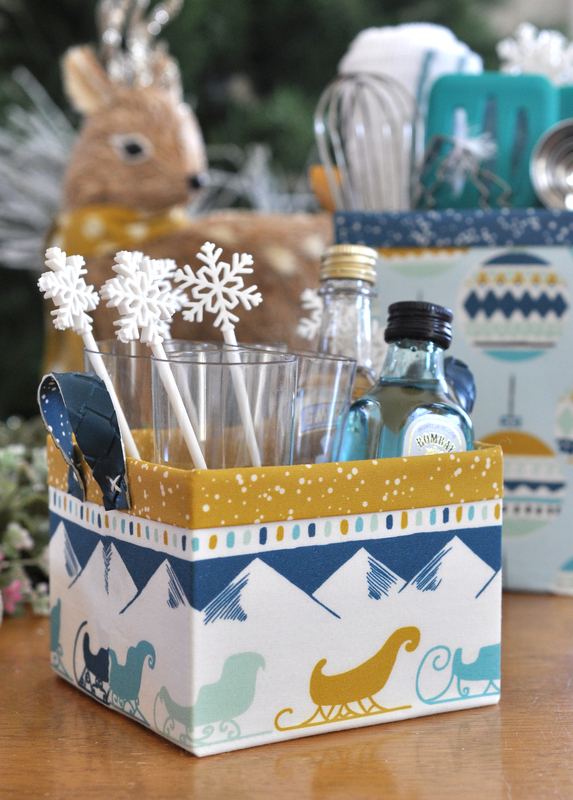 They’re perfect for covering snacks and dishes at holiday parties, carrying a dish to a party, storing leftovers, and they’re great for gifts! Pick up a cute, unique bowl, make a matching cap, and give it as a gift. 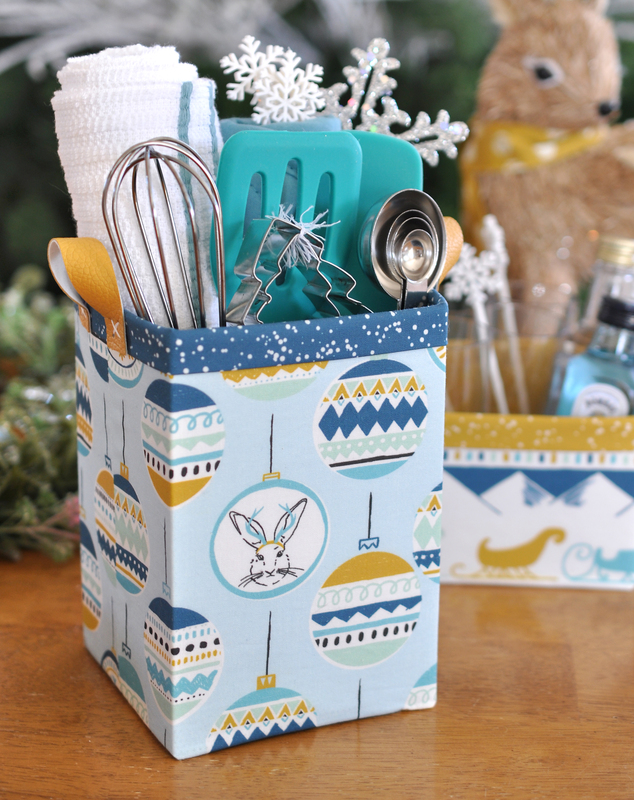 You can fill it with a treat or kitchen tools and the recipient has a useful and adorable item that they can use everyday. I’ll be sewing up some new ones this week with cute holiday fabrics and will share them soon! Click here for the tutorial. I hope you’ve found some inspiration in these projects! They’re just a few of the free patterns & tutorials I have available. There are some other great little items to make for gifts, such as my Flex Frame Pouch, and you can find all of them HERE. Hello, my Sew-A-Long friends! Today I’ll be sharing a few tutorial links for those who are joining in the Undercover Maker Mat SAL, but may not be familiar with basic quilting or paper piecing (which is an optional element!). There are a lot of step-by-step photos in the pattern and many basic techniques, but it does require basic knowledge of making a “quilt sandwich”, binding a quilt, and paper piecing , if you choose. If you haven’t viewed my Instagram stories, please pop over and take a look. I’m saving all the SAL stories in a highlight which you can access anytime from my main profile. You can also turn on notifications for my posts and/or my stories so you don’t miss anything. I shared a few tips and examples yesterday on how to simplify or customize your mat, so this can help you with the planning stage. Onto the tutorials! If you’re new to quilting, you will need basic knowledge of how to layer your top, batting and backing for the main mat body (aka the “quilt sandwich”), and how to do the quilting stitches. 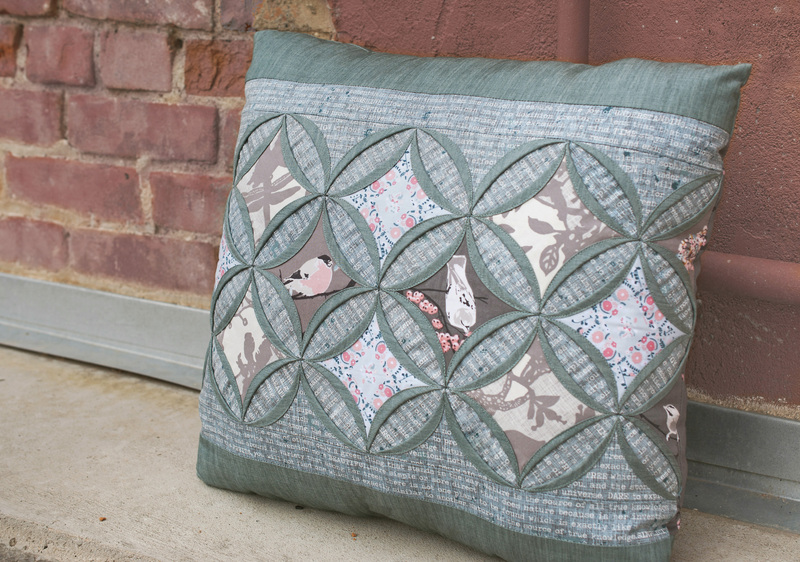 This tutorial from Suzy Quilts covers all the basics. It applies to a large quilt, so working with your main mat body will simply be a smaller and simpler version! Straight line quilting is a great design for beginners, or a crosshatch is a always a nice option, too. I’m not sure its mentioned in the tutorial, but I love using a Herra Marker (a bone folder or scoring tool also works similarly) to mark my quilting lines, especially for something like a crosshatch. Here is a video on using a Herra Marker. Another quilting technique you will need to know comes at the very end of the project, but it is binding. This is the little edge “wrap” that goes around the entire piece and seals everything up. Here is a helpful tutorial from Craftsy. Lastly, we have paper piecing. If you’d like to create the butterfly pocket panel as shown in the pattern, but have never paper pieced before, don’t be intimidated! This is a great time to learn! 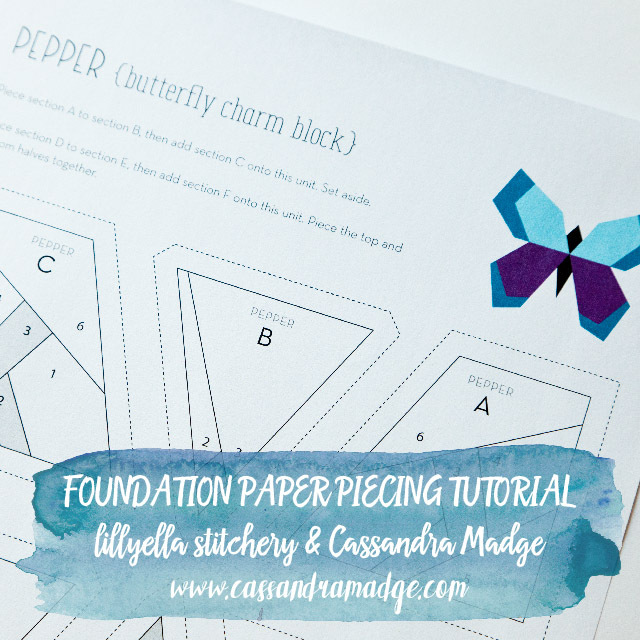 Cassandra Madge did a wonderful two-part tutorial for beginners using my Butterfly Charm Blocks pattern and you can find part 1 here and part 2 here. As always, feel free to contact me anytime if you have questions along the way, and stay tuned for more helpful tips here and on Instagram! Howdy, friends! Sheesh, this blog has been neglected. Some days I feel bad and others I don’t because most people have the attention span of a goldfish these days and blogs aren’t what they used to be. Still, I love to have a space to share more than a few words and one photo of something, regardless of who ever reads it! Life has been extra crazy lately, but I squeezed in a few days of hand stitching recently because I needed to create something beautiful for myself. I stitched up the new Brimfield Meadows block from Brimfield Awakening and HOT DOG! I couldn’t be happier with it. It was quick and fun to sew, it came together like a dream and it’s such a unique and beautiful shape. I used Sleeping Porch lawn to match the bed quilt I’m working on and plan to make a pillow out of this block to go in my bedroom. While I’m here, I just wanted to share a few things I loved about this pattern and how I sewed up the variation I chose. I’m also going to talk a bit about some of my favorite notions for English Paper Piecing, because I often get questions in my social media posts. I am by no means an EPP expert, but I have experimented with a variety of threads, basting techniques and stitching methods, and definitely have my favorites that I think yield nearly flawless results. Above are just a handful of the fabric placements I was playing with for this block. My final block matches the top left diagram above. You can see all the separate segments of the pattern and how I chose to combine two or three pieces in areas to create one larger piece. I love how you can do this to change the final look of there block, use larger fussy cuts, and make the stitching go quicker! I simply taped some of the segments together to create the larger units. Note that the outer most tip of every “petal” is perforated on the paper so you can use them whole or split them as I did. Also, another design variation that isn’t shown above is different arrangement of those center “orange peels”. You can flip them 180° from how I used them, sew them up as one unit or even leave half or all of the segments out completely, letting your background show through. You can check out the hashtag #BrimfieldMeadows on social media to see some beautiful examples of all these variations. While this photo above may look like someone’s unmade bed, it’s how I audition fabrics. If you look close you can see the method to my madness! I’m a total planner, so even when I say I’ll just “wing it”, I always end up making diagrams and taking pics of piles of fabrics to help me plan things, or at least start in the right direction. Basting curves was new to me, and it took me a couple tries to figure out the best order of basting down the sides, but once I did, it was really easy! I basted the concave edge first, then pulled the convex edge as needed to make it smooth, and did the two straight sides last. I cut small notches to help with the concave curves which you can see below. As I mentioned above, I used small pieces of tape to connect the paper pieces and create the larger units, which you can also see below. When I first started EPP, I would thread baste, mainly because I didn’t have glue basting supplies and didn’t feel like researching how to do it! I tried glue basting because it seemed to save time and it did not work for me AT ALL! The problem was that I was applying the glue all the way to the edge of the paper and I couldn’t grab my fabric to stitch it. I watched some amazing tutorial videos from the queen of EPP Karen the DIY addict and it changed my glue basting life! I watched her apply the glue a bit in from the edges and it was like a “why didn’t I try that? !” kind of moment, but it works like a charm and I’m all glue now! I prefer to use a glue pen (such as Sewline or Fons and Porter). When it comes to stitching all those pieces together, I also tried many methods and many threads! If you know me at all, you probably see what a perfectionist I usually am, so visible stitches drive me BONKERS! Though I have learned that sometimes this is on purpose to show consistency? Regardless, it’s not for me. Once again, Karen saved my EPP life with her flat back stitching tutorial. You can see in the photos above of the back of my block that my stitches are by no means consistent or perfect, but you can see directly above how they are not visible at all from the front. This is the only stitching method I use and while some people think it’s slower than others, I find it very easy and quick. It helps to line up pieces and I love that the stitches are hidden so well. Last but not least, my favorite thread and my favorite thimble! Hands down, I love InvisaFil thread from WonderFil. It is 100wt polyester and virtually invisible. I do double the thread over and sew with two strands simply because I like a secure thread on my needle, rather than a loose tail, but it’s strong enough to be used as a single strand. I have tried 80wt cotton threads and they also work well, but I’m a tight puller and am much more likely to break the cotton thread, but I’ve never broken the InvisaFil. I match my thread to my lighter fabric when possible, but as you can see in my detail shots, it’s not too important since you can’t see the stitches! So, that’s all I got for now! I hope some of these little tips and resources have been helpful to you. I’ll be sure to share my finished Brimfield Meadows pillow once it’s complete, and you may very well see more blocks popping up because I am in love with this pattern (which you can find here if you’re interested)! I can’t remember what spurred this last minute idea, but OHEMMGEEE is this adorable or what?! I used my free Sturdy Basket Pattern to make a snow covered chimney to hold my Christmas cards. Now I need to make another to hold Santa! I used the brick print from Grafic fabric for the basket outer and lining and some faux sherpa for the “snow”. The sturdy fabric basket pattern (find it here) includes directions on making any size basket you wish, so you can customize your chimney, but I made mine 6.5″ wide x 6″ high x 3.5″ deep. In the photo below, I did put a little padding inside the bottom of the basket to make the cards sit a little higher. I didn’t want to make the basket shorter because I wanted to see enough brick. I made the basket as specified in the pattern, but I did not press the exposed top of the lining in half before folding it over the top of the basket , I just folded it over so the raw edge was exposed. It gets covered by the sherpa so it doesn’t matter. You really don’t even need to make the lining larger than the outer piece since it is covered. I did it because I wasn’t sure if I would fold the sherpa inside or wrap it on the outside just around the top. To make the snow top, I cut a piece of the sherpa 20.5″ wide by 5″ high then simply wrapped it around the top of the basket and folded half to the inside. The backing of the sherpa clung to the brick fabric really nicely so I didn’t even need to secure it in place, but you could use some glue if desired. If you make your basket a different size, you’ll need to adjust the size of your sherpa cut. Simply add width x 2 + depth x 2. I added a half inch on top of this just to be safe. This project was so quick and fun. I definitely want to make some for gift giving next year! I’d love to see what you make! Please tag me on social media or use the hashtag #sturdyfabricbasket. Fall is officially in the air and I’m closing out the Fabric.com Fall Block Party with my contribution, Flutter By! If you’re just joining the party, you can find all the free blocks shown above on the Fabric.com blog here. This collection of quilt blocks is an excellent skill builder with traditional piecing, foundation paper piecing, english paper piecing, and appliqué. 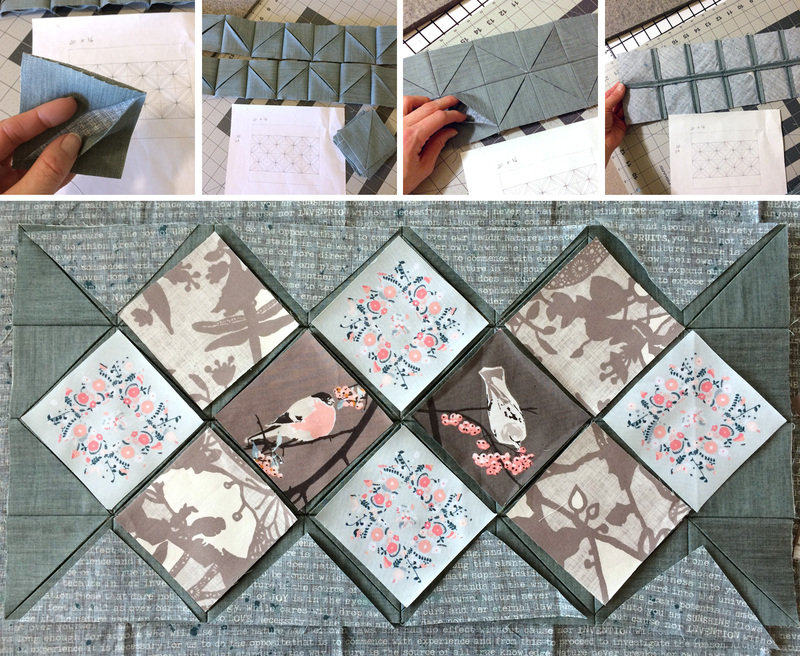 My Flutter By block is foundation paper pieced and sews up quickly with just three simple sections. The pattern includes the butterfly as shown and reversed so your butterfly can head East or West! You can download the free pattern from Fabric.com here! I wanted to use an unexpected mix of fabrics on my block, with a variety of prints and textures, and am so in love with the result! I started with the focal floral print, which is Liberty of London Lawn. Many people do not think about using Lawn when quilting, but it’s quite dreamy, especially when paper piecing because it is lightweight. The pink stripe fabric is a woven from Loominous by Anna Maria Horner, dotted line coral. The stripes are raised and add such a lovely textural element. 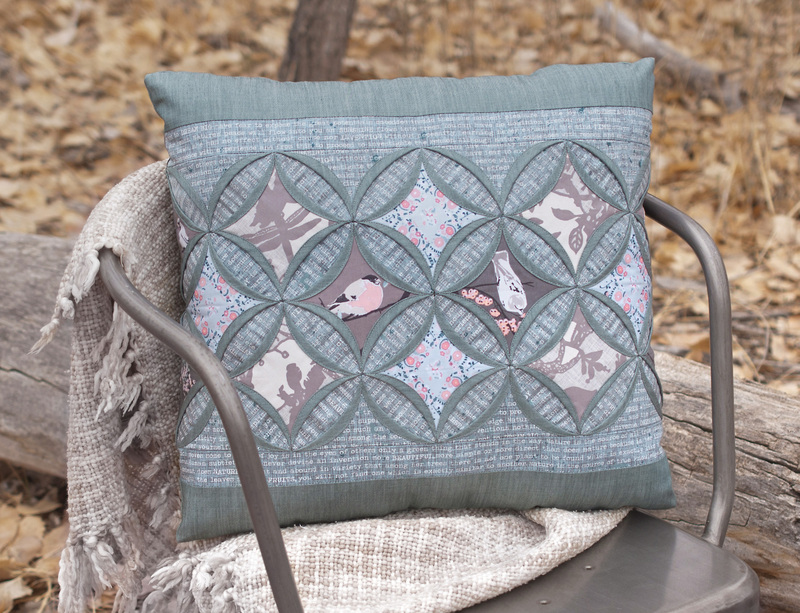 The remaining prints are quilting cotton from different designers – Indah Batiks Herringbone Coffee, Dear Stella Trail Mix Feathers Mustard, Dear Stella Honey Bee Scallop Dot Corn, and Cotton + Steel Ombre Pigment Aqua for the background. I love how the gradient of the ombre prints plays subtly in the background. It’s so perfect for sky! I have a few fun quilt layout and other project ideas in mind for this block, so keep an eye here and on my instagram page for those! I hope you enjoy my contribution to the Fabric.com Fall Block Party! Please share your projects with the hashtags #flutterbypattern and #fabricdotcomblockparty! Fall is in the air and Halloween is right around the corner! I usually don’t have any ‘lil monsters in my life, but since one of my besties happened to be in town for an extended visit, I couldn’t resist whipping up some new treat bags for her littles. I used solid pieces for the top panel, instead of the pieced bat as in the original, making this project really quick. I used a spider pom pom trim on one and metallic skulls on the other, both of which I found at Joann’s. I hope this inspires you to whip up some treat bags for the ‘lil monsters in your life! I’d love to see what you make. Tag your pics on social media with #midnightbitetreatbag or email me! Happy Haunting! I first got to play with Katarina Roccella’s newest line, Blithe, when I made my Bias Weave pillow for the Lookbook last fall. It was love at first sight before I even had the fabric, but you just cannot help but fall head over heels in love once you start piecing it together. Something about the palette and the way it plays with the Art Gallery Fabrics denims just melts your soul. I had a few bits and pieces left from my first project and knew exactly what to make for my stop on the Blog Tour. I see cathedral windows as a quilty bucket list item, you know? I’ve always loved them (even before I was quilting), and recently watched a friend make a Christmas pillow and it really sparked my fire. It was time. I spent hours looking at and trying various methods and tutorials and decided that the Faux Cathedral Window tutorial by Diary of a Quilt Maven was the way to go for me. The method is pretty much the same as the Missouri Star easy cathedral windows tutorial as well, in case you prefer it in video form. What I liked most about this method was two things – first, it used small pieces of fabric, and that was all I had, and second, it felt very precise to me. Being a perfectionist, this is key. It’s also super easy to adjust the size of your windows to anything you wish and to create any shape piece you wish. I won’t walk you through the steps, because that is what the tutorial is for, but below are a few progress photos that may help demonstrate how I translated the tutorial into my finished pillow. Please excuse the bad lighting, it’s been a “work all night” kind of month! If you have any questions, please feel free to leave them in the comments below or send me an email anytime. The solid fabric I used along with Blithe on my pillow is solid smooth Art Gallery Fabrics denim in Cool Foliage. It is absolutely perfect with this line and always a dream to work with. 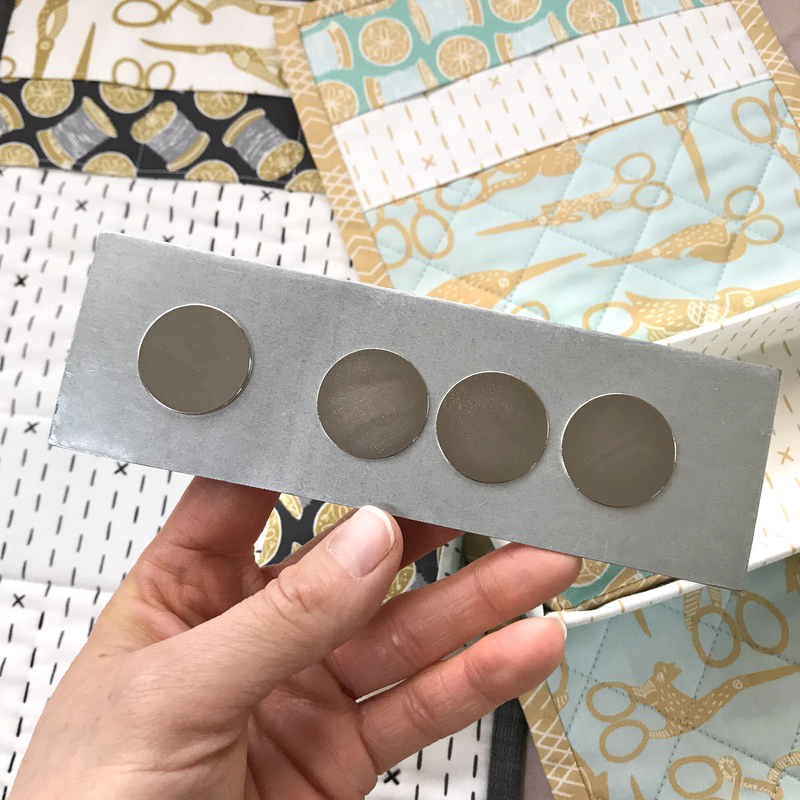 I made my window foundation pieces 3″ to start, versus 2.5″ as in the original tutorial, and I pieced 8 units across and four units down to create the window panel. I chose to use the text print inside the petals and the denim for the petal edges, but I also really love the look when these two elements are the same fabric. After the full window panel was complete, I pieced on the top and bottom strips that included a 1″ strip of the text print to help carry the design over, and then a 3″ strip of denim. 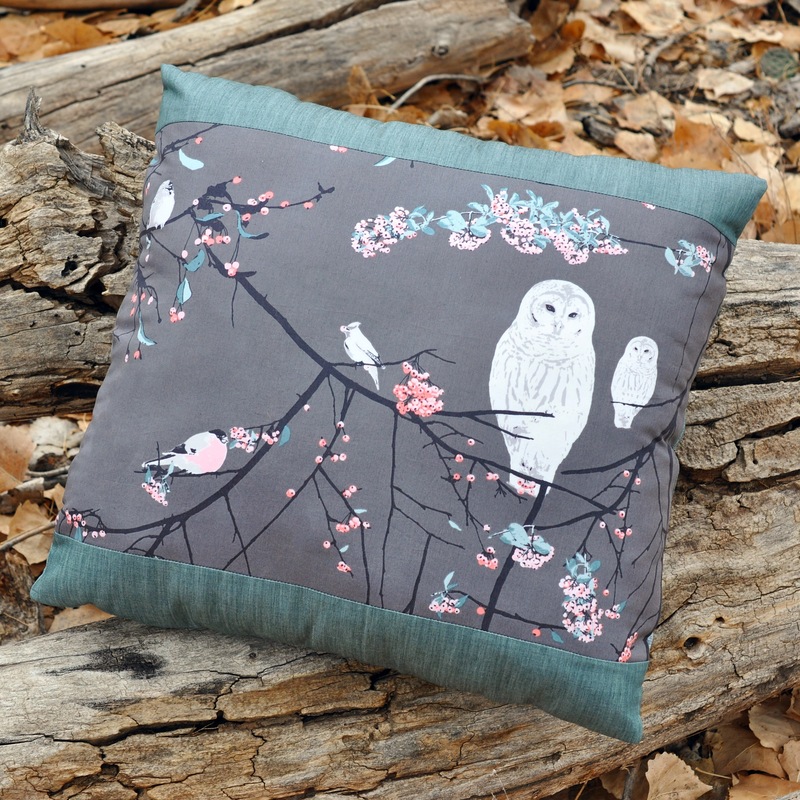 I kept the back simple to showcase the beautiful owl print, but I think it would be really lovely to make a second window panel so the effect wraps all the way around the pillow. The finished pillow measures 20″ wide by about 18″ tall. The end result was exactly as I envisioned and there was nothing I did not like about the method I used to make it. l definitely be using it again and may actually have a cathedral window obsession after this experience. I already have two more projects planned! Be sure to check out all the other *amazing* projects in the blog tour by visiting Katarina’s Instagram feed and through the hashtag #blithefabricsblogtour! 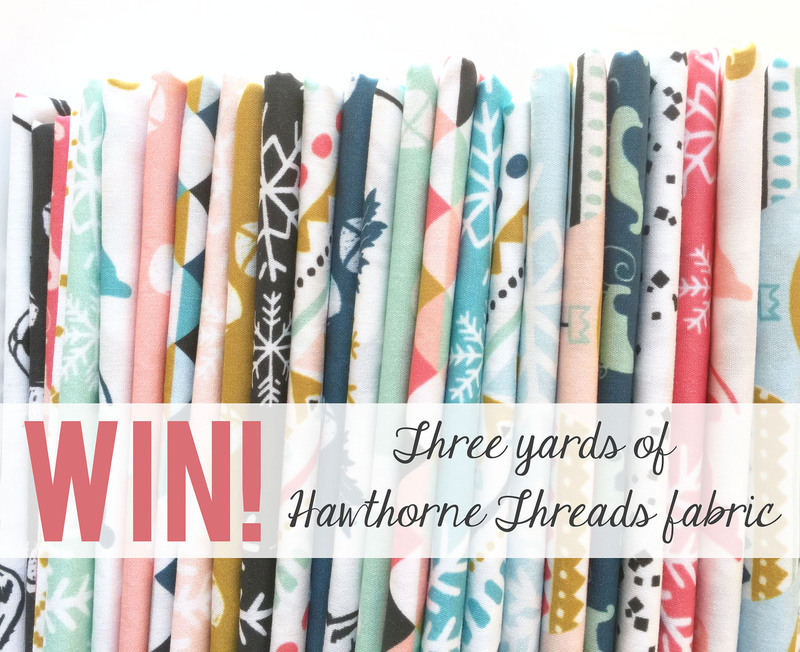 As I mentioned in my previous post, my (belated) stop on the Hawthorne Threads Oh, What Fun Blog Hop is all about easy-to-sew (and easy to customize!) 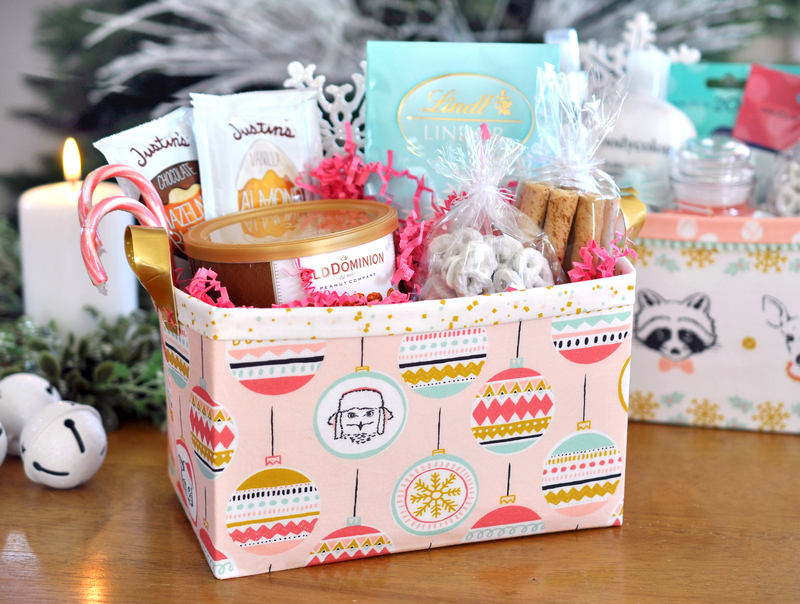 projects that are perfect for holding holiday gifts. Ditch that wrapping paper! I’ll be talking about how modify my free Sturdy Fabric Basket pattern to create ANY SIZE finished piece and sharing an adorable fabric sack pattern that I think you’ll love. 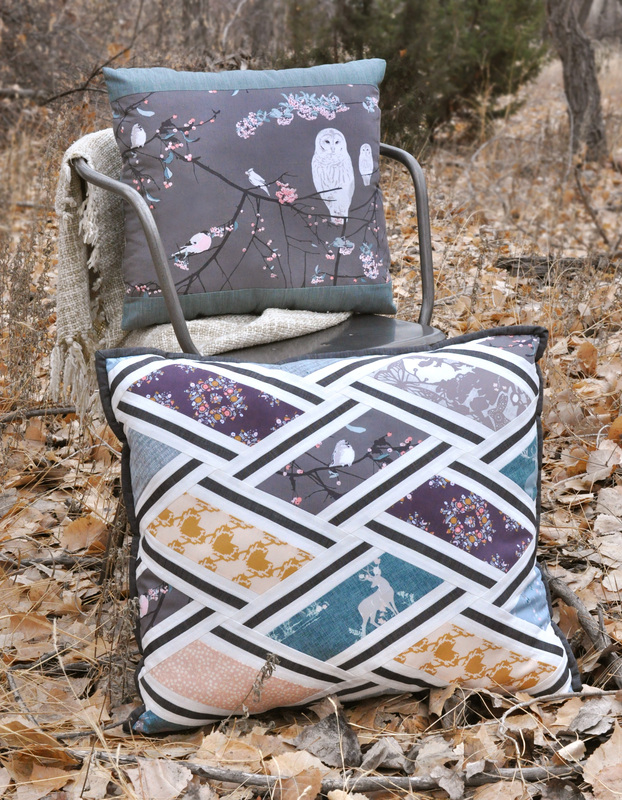 This new in-house fabric line by Hawthorne Threads could not possibly be any cuter. I’m pretty sure I squealed a little when I first saw it. Some of the prints are perfectly holiday, but what I really love is that some of them are more neutral – winter themed, or just geometric – and can be used for a a variety of occasions, which I’ll talk about more later. So, let’s get to it! 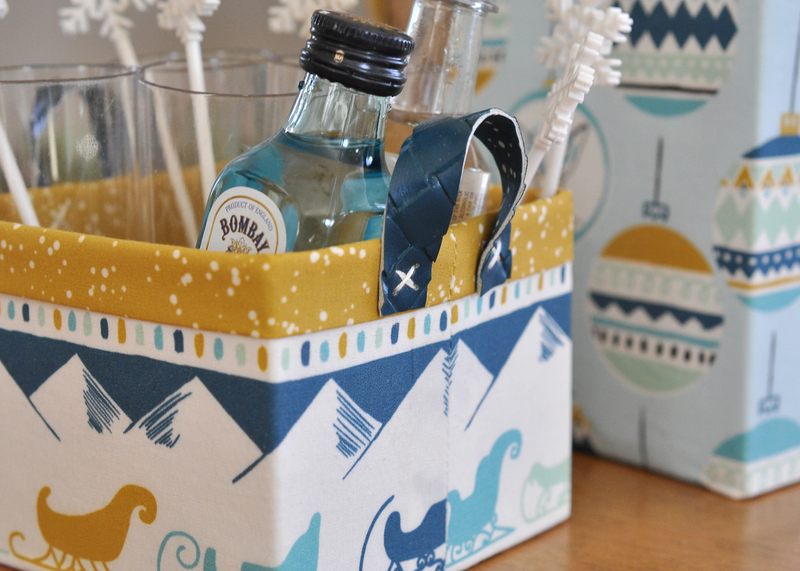 These Sturdy Fabric Baskets are one of my favorite things to make. They’re quick and easy, and useful for so many things (plus, totally adorable!). I initially created the pattern a couple years ago to make baskets for holding fat quarters, scraps, trims, and notions in my sewing room, and then made one for holding remotes in the living room, another for hair accessories in the bathroom, and one for next to the door to catch my husbands wallet, sunglasses and all the miscellaneous junk that lives in his pockets! You can showcase a fun focal print or create any patchwork design you like (there are patchwork directions in the pattern). The original pattern size (shown above and below) finishes at 8″ wide by 5″ high and 5″ deep, and is perfect for mixed gift baskets of items such as bath & body products or edible treats, just to name a couple ideas. 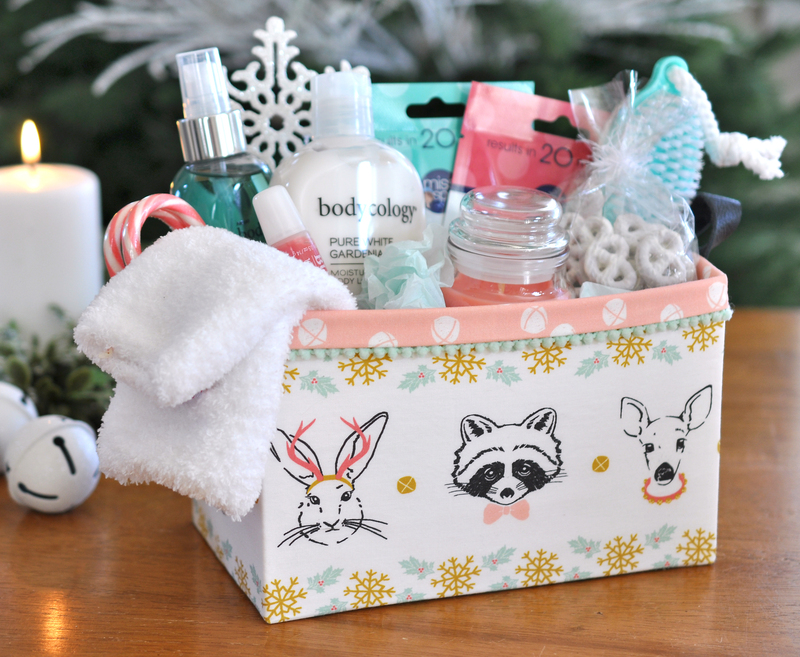 I love these baskets so much, I want to gift them to myself! I can do that, right? I mean, I DID make them. 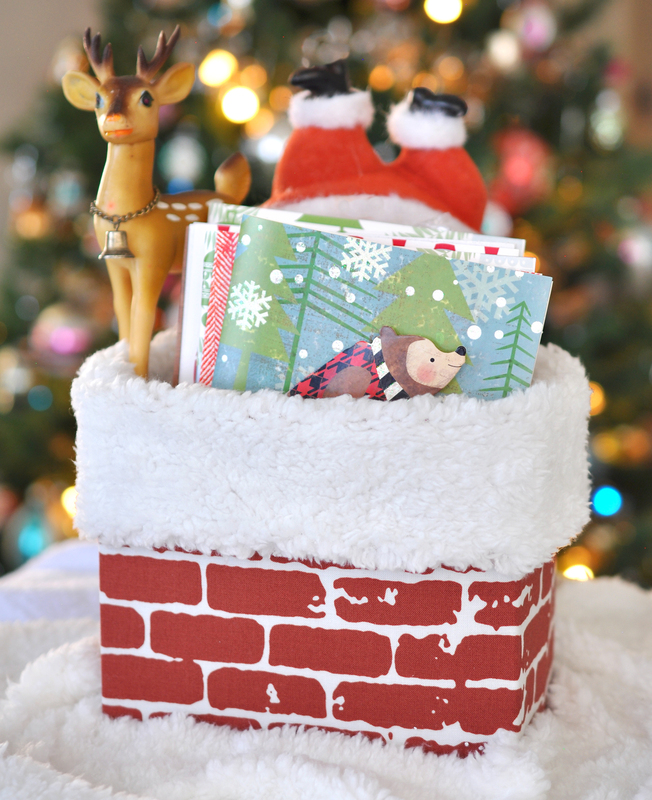 Another great feature of this basket size is that it’s perfect for holding Christmas cards, so your recipient can repurpose it after it’s emptied. You can also give a bag of potpourri along with it and it can be used a cute holiday decoration! I used my favorite prints from Oh, What Fun on these two. The row of faces is cut from the border panel print and was the perfect size, and then I used the center of that panel (the cute confetti) to make the lining of the other basket. The ornament print is called Baubles and I also used it to make some cute gift tags which you’ll see later in the post. I added tiny pom pom trim to the basket shown above and I love the look! I tucked it under the lining foldover and glued it in place – super easy! In the pattern file, I talk about using old belts or scraps of leather for the basket handles (which are optional.) I used scraps on both of these baskets. The gold was cut from a pouch I found at the thrift shop and the black is from a leather scrap pack I found at Hobby Lobby. I used embroidery floss to stitch them in place. Thinner, lighter weight materials work best for the handles so they can bend easily. If your leather is too thick or sturdy, it can bow the sides of the basket out. You can also use ribbon, bias tape, or fabric in place of the leather. I receive emails quite often asking if I can resize the basket pattern cutting directions to create a specific sized piece that someone wants to make, so updating the pattern on how you can do this yourself has been on my to-do list for awhile, and this seemed like the perfect time! With a little math (don’t worry, it wont hurt too bad! ), you can create any size basket you wish. I’ve updated the original Study Fabric Basket PDF pattern file to include these directions and you can download it here. Now I’ll show you a couple different sized baskets I created to get your creative juices flowing! I wanted to make a piece that was sized for kitchen utensils and accessories, because that is another favorite set of mine to gift (perfect for housewarmings and showers, too!). 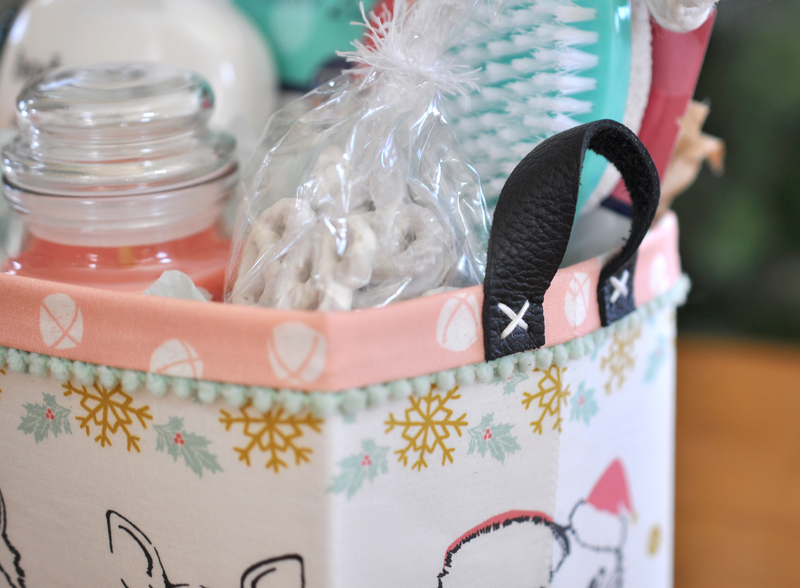 This basket measures 4″ wide by 4″ deep and 6″ tall and I filled it with a dish towel, pot holder, whisk, spoon, spatula, measuring spoons and cookie cutters. I used my favorite Baubles print in the Glacier Blue colorway and the lining is from Hawthorne’s Stardust basics line, which comes in 54 colors and coordinates so nicely with Oh, What Fun because it looks like snow! 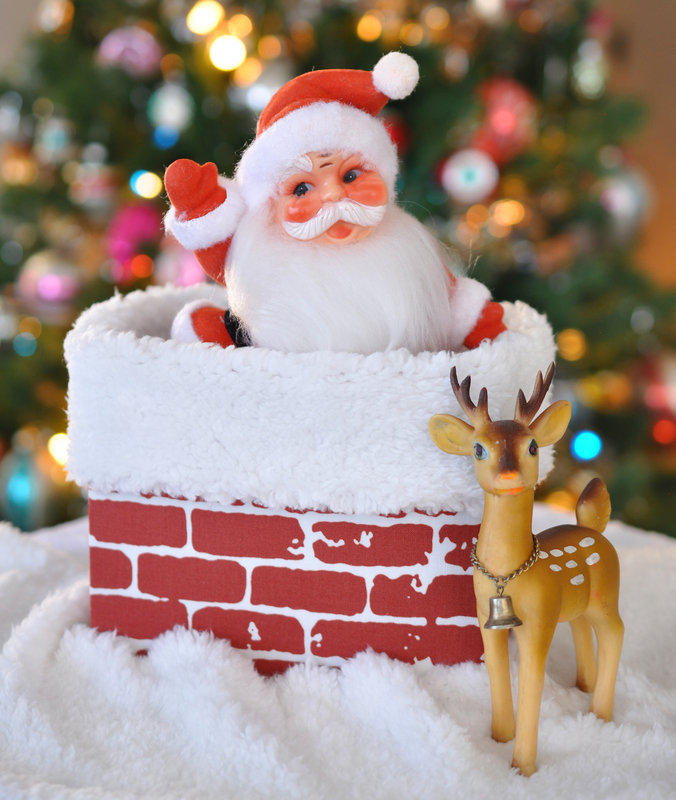 And let’s not forget the guys or hard-to-shop-for friends and family on our lists! This basket measures 4″ wide by 4″ deep and 3″ high and holds four shot glasses with stir sticks and two mini bottles of liquor. It would also make a fun and inexpensive secret santa gift. Plus, this small basket is a nice size for later holding keys, jewelry, sewing notions or many other things. It also fits a pillar candle or mug. The handles on both of these baskets were also cut from old thrift shop pouches. Both are vinyl, so they had white backings. I left the white showing on the yellow handles and for the blue handles on the short basket, I glued a piece of the dark blue stardust to the backside before trimming them down. It worked out so well! I also did this to the gold handles on the treats basket shown at the beginning of the post. 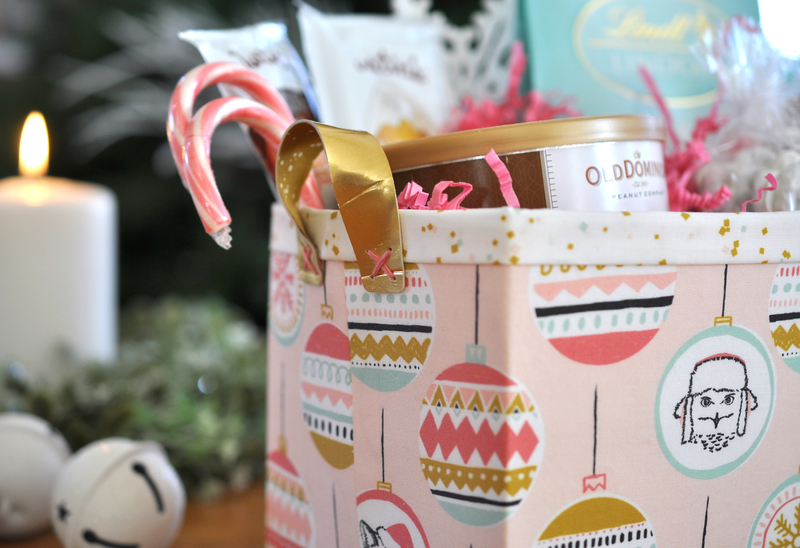 I have one more fun pattern to share, because it’s just perfect for gifting homemade treats (or a million other things) and then your recipient also has an adorable and useful little sack! I’ve had this Button Lunch Bag pattern from Purl Soho bookmarked forever and made a few modifications to dress them up and make them quilting cotton friendly. The pattern calls for a sturdy cotton (such as a canvas), uses one solid fabric, and has a rolled hem, so I made a few easy changes to make them work with my materials and the look I was going for. I wanted my bags to have a bottom accent fabric, so I pieced together the full panel before assembling the bag and then added some cute trim along the seam line. Also, since a rolled top hem wouldn’t look as nice with a printed quilting cotton, I instead used binding around the top of the bag. I added it last after assembling the bags. I used Pellon Shapeflex (SF101) to give the bags some extra bulk and I love the feel of them. I added the interfacing after piecing my full panel, before assembling the bag. The original pattern uses binding to hide the inner seams, but I just used a wide, tight zig zag stitch which was quick and easy, but gives the seams a clean look and prevents fraying. Alternatively, if using binding around the top, you could make a full lining for the bag. Simply make a second bag, but with right sides in instead of out, slide it inside your assembled outer bag, and then stitch the top binding down through both, holding them together. For these bags, I used two of the prints from Oh, What Fun that are not holiday specific. They are definitely festive enough for holiday gifting (especially with some metallic trim! ), but keep the bags neutral enough to be reused all year long. 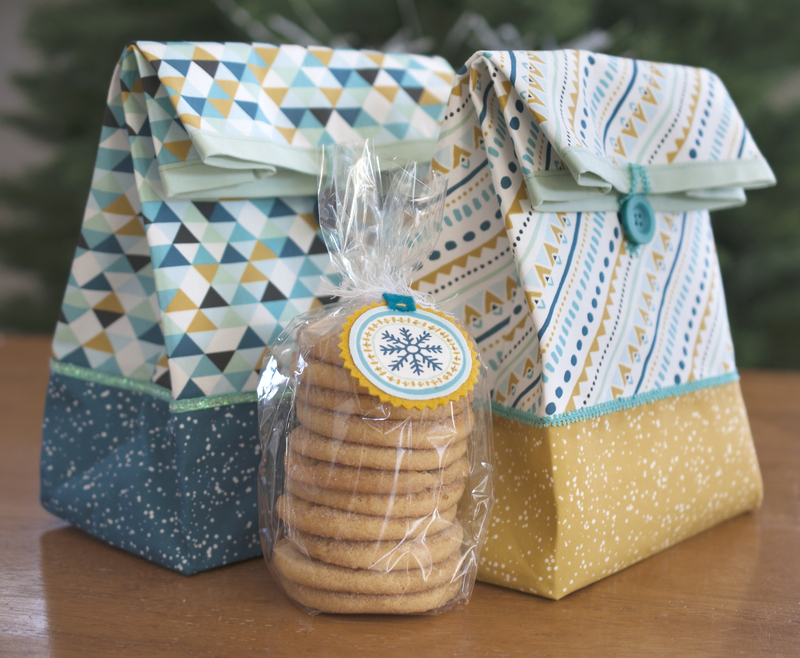 I used the Baubles print that I love so much to make the little tag on the cookies. 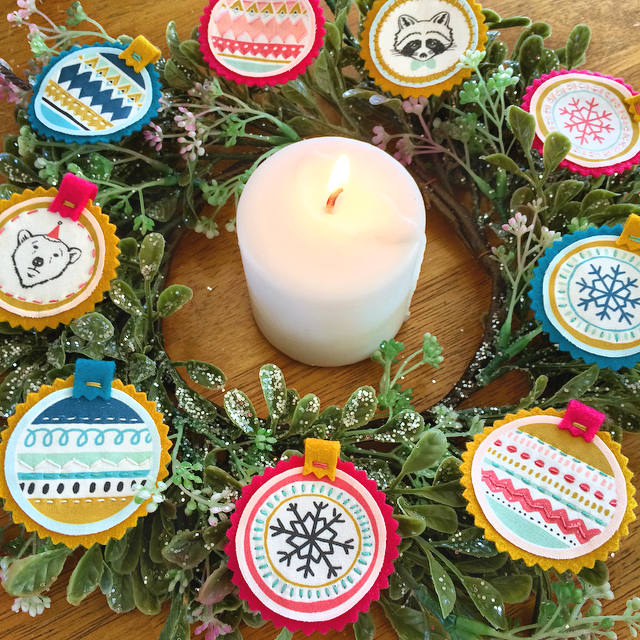 I fussy cut the ornament circles from the print and used embroidery floss to hand stitch them onto felt cut with pinking shears. I then stitched down a small, folded piece of felt onto the top to make the hanger. You can use a light print or solid cotton on the reverse side to write or stamp a name. I had so much fun with these, I couldn’t stop! They’re going on all my gifts this year, and I think I’ll hang a few from my tree, too! I truly hope you have found this post useful and inspiring! All of these projects are easy and satisfying because they sew up quick and look totally adorable when done. 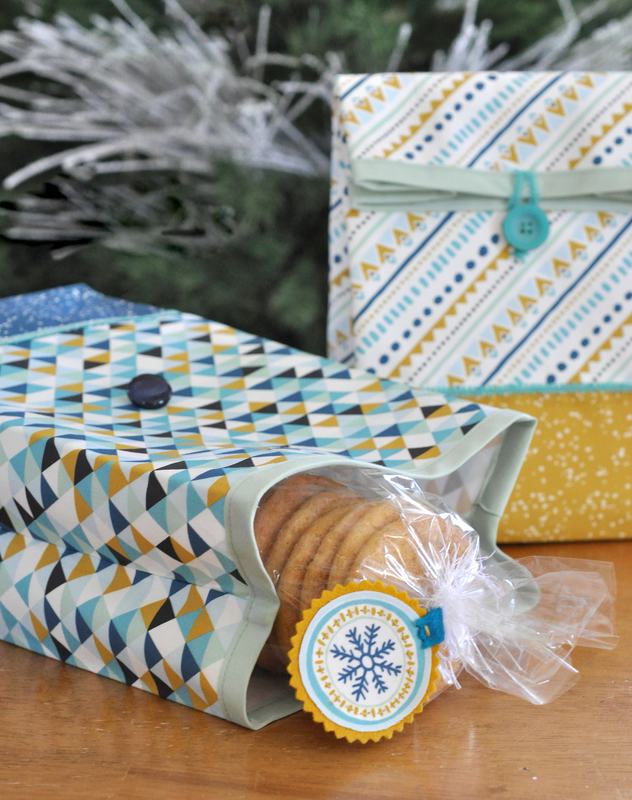 This year I challenge you to ditch the wrapping paper and make some “gift wrap” instead! As always, if you have any questions about the pattern along the way, you can contact me here anytime. Please be specific, so I can best assist you. Now before you go, be sure to check out the other stops on the Blog Hop and see all the fabulous makes!